Carlist Rieekan was an Alderaanian general who, throughout his life, served the Galactic Republic, the Alliance to Restore the Republic, the Alliance of Free Planets, the New Republic, and the Galactic Federation of Free Alliances. He joined the Republic’s Judicial Forces at the age of seventeen before serving in the Army of the Republic during the Clone Wars. With the advent of Supreme Chancellor Palpatine’s ascension to Emperor and the installment of the Galactic Empire in 19 BBY, Rieekan immediately rejected the new regime. Instead, he chose to serve the Royal House of Alderaan as a civilian tactician, before becoming one of the founding members of the Alliance to Restore the Republic, a rebellion against the rule of the Emperor. Gray Hoth style gaitered boots. Tan pants, no distinguising marks and no visible pockets. Light tan jacket with high standing and batted collar, quilted yoke in a darker tan. Two breast pockets with red or rust colored piping and tab closure. 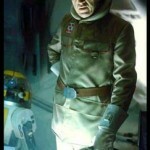 Mid-thigh in length (possibly quilted like that of a Hoth Trench Trooper). Velcro closure all the way down the front. Two large cargo pockets below the waist. Belt loop on each side and two in the back. Tan overtunic with pocketed sleeves. light gray with a darker gray gauntlet with comlink. Medium brown belt with octagonal buckle. Rank badge, 5 red discs on metal.